Stamping your feet in a rage when you get stressed out may not be a great idea. You could do some damage and wreck those designer heels at the same time. 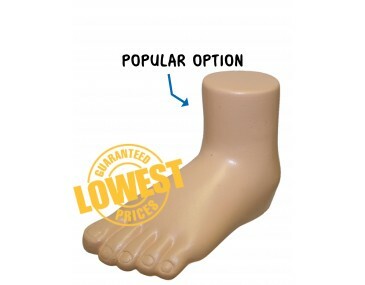 Get yourself and your office mates some of these fabulous stress toy feet and you can stamp and bash them until all your irritation and tension is gone. They make ideal office toys and are trendy and fun too. The toys are manufactured from a pliable material that can take a bashing and smashing and not lose their shape. They make fabulous stress relievers in the work place and at home. Stress is a hidden cause of many medical problems that are experienced by large numbers of people of all ages. Get your clients relaxing with this fun give-away. Any business in the foot care industry, shoe manufactures, medical practitioners and those involved with feet in general can create a fabulous advertising campaign with these stress toys. Speak to us about branding, our listed price includes branding of your logo or graphic in a single colour print onto the foot. We offer a product turnaround time of two weeks, but we can offer even faster turnaround times for urgent orders. This product is supplied in bulk quantities. Give your clients a quirky and different freebie at your next trade show, expo or outdoor event. You are sure to create a buzz at your stand and you will have many feet stamping over to see what the commotion is all about. This product is stocked and branded in Australia and is available for delivery within Australia only.